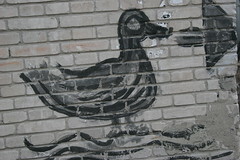 Roast duck tastes better in Beijing. 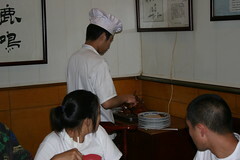 I’ve had it several times in the United States, but Peking Duck is always better in its birthplace. 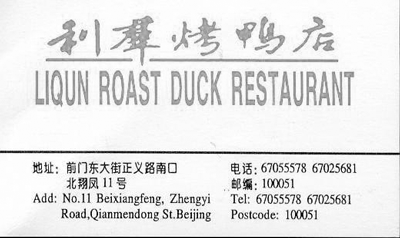 My favorite place to eat Peking Duck is hole-in-the-wall restaurant, Li Qun Roast Duck Restaurant, located in the rapidly shrinking Hutong east of Tiananmen Square. The experience of visiting Li Qun has changed in the past couple of years – you used to wind through the roads of the hutong, pursued by pedicab drivers on your way to the restaurant. With Beijing rapidly tearing down portions of the hutong, replacing narrow streets with roads and housing with updated apartment living, there’s a direct path to get to Li Qun Roast Duck Restaurant. Some of the old signs still remain. Once inside, the feel of the restaurant has changed very little. 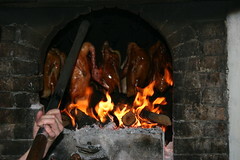 The first thing you see is the brick oven where ducks are roasting. A narrow corridor leads either to the main dining area or to a private dining room if your party is too large for the 4-top seating that makes up most of the cramped dining space. There are two ways to order (both require calling ahead to let the restaurant know how many ducks you need). You can either order a complete meal, including ducks, pancakes, hoisin sauce and fixings, along with some additional dishes; or you can order a duck and sample things from the menu ala carte. If you’re brave, you can try things like duck feet in mustard sauce and fried duck gizzards, or stick with things more familiar to a Western palette. For assistance in getting to Li Qun Roast Duck Restaurant, I highly recommend calling to have a cab driver get directions in Chinese. The staff speaks reasonably good English, so you’ll be able to hand off the phone (and call ahead for ducks) even if you don’t speak any Chinese. You can also print this card for additional help in getting to the restaurant.